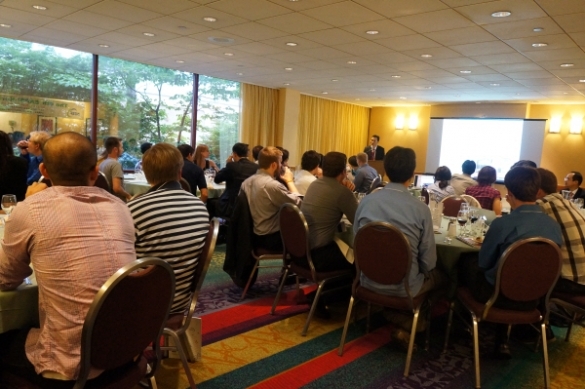 KUSCO is pleased to announce that the 4th EAPSI-Korea Conference was successfully held at Courtyard Marriott Hotel in New Jersey on August 09-10, 2013. Since 2010, KUSCO has organized the conference meeting in the U.S. to strengthen cooperation in S&T between the U.S. and Korea through networking among participants based on research and cross cultural experience. This year we invited 49 program participants from 2000 to 2012. Also, we invited Dr. Dennis Hong, associate Professor & Director of RoMeLa, Virginia Tech., and Dr. Daniel Lofaro, George Mason University Assistant Professor & DARPA Robot Challenge Track-A (DRC-Hubo) Team Member, as guest speakers for EAPSI-Korea Leadership Workshop. The event was mainly composed of two parts: ‘Experiencing Korean Culture’ and ‘Exploring S&T subjects related workshops’. All the participants of this conference enjoyed a beautiful summer weekend connecting and reconnecting with old friends, and participating in various programs.